April 15, 2010 was Hamden Public Library Volunteer Recognition Day. Each year, volunteers from Hamden donate thousands of hours of their time helping the library, and each year the library hosts a reception for them to express our gratitude for all their hard work. 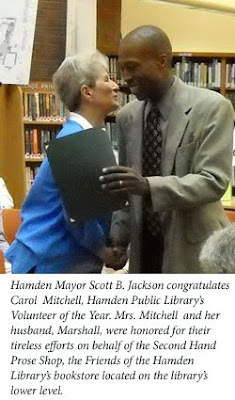 Mayor Scott Jackson was on hand to offer his appreciation of our volunteers, and asked "all citizens to join me in thanking and congratulating these wonderful people for their outstanding work on behalf of the library and our entire community." Visit our Facebook Page to see more photos of the Volunteer Reception!